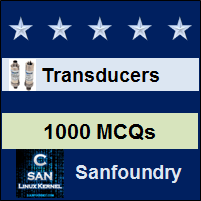 This set of Instrumentation Transducers Multiple Choice Questions & Answers (MCQs) focuses on “High Frequency Amplifiers”. 1. Which of the following represents the radio frequency range? Explanation: Radio frequency range or simply RF range lies between 100 MHz and 2000 MHz. 2. Which of the following represents RF? Explanation: RF is the short form of radio frequency. Explanation: High frequency amplifier in FM telemetry have fixed frequency since they amplify in narrow bandwidth range. Explanation: Wide band amplifiers are used in CRO since their operation lies in a wide band of frequency. 5. Ideal op-amp have _______________ input impedance. Explanation: Ideal operational amplifiers are characterized by infinite input impedance. Explanation: Gain of wide band amplifiers are limited to a band 100 to 300. 7. Ideal op-amp have equal input impedance and output impedance values. Explanation: Ideal op-amp have infinite input impedance and zero output impedance, hence they are not equal. Explanation: Wide band amplifiers are usually single ended devices. 9. Which of the following can be used as an amplifier? Explanation: IC 741 is an op-amp IC and they can be used as an amplifier. 10. Which of the following op-amp configurations are not possible? Explanation: Op-amp can be configured to operate in many forms such as a differential amplifier, inverting amplifier and non-inverting amplifier.